Mention the name Paul Andreola in Canadian financial circles and those in the know require no further explanation, given his outstanding track record as a stock picker in non-resource microcaps. Taking the methodology that has served him so well as a private investor, Andreola has painstakingly created a portfolio of investments in small companies for NameSilo Technologies (CSE:URL) (note: NameSilo Technologies began trading under its current name and symbol on December 6, 2018. The company previously traded as Brisio Innovations). NameSilo shares have more than doubled in value over the past year and Andreola credits this in part to a shift in strategy that will see the company take larger percentage positions in its portfolio holdings going forward. Diversification that sees everything from drug research to truss manufacturing included in the portfolio is a big help as well. The other key to delivering strong returns to shareholders is a fascinating private-public arbitrage concept that requires experience and a broad, deep network to achieve. Andreola shared the NameSilo approach to generating superior investment returns with Public Entrepreneur during a mid-November discussion in Vancouver. NameSilo Technologies has some similarities to a classic investment fund, but plenty of differences as well. Can you explain the NameSilo concept and business model to get us started? The company is run by investors first and foremost. We use a model we think is quite rare, especially in the microcap space. We look for companies that are more advanced than pure start-ups. Companies that we think have significantly less risk than the typical business entity that gets listed publicly but with as much, if not more, upside. We are looking for situations that have that perfect risk-reward scenario that allows us to feel comfortable putting in a significant amount of money. We take a private equity model and put it inside a public vehicle. We are looking for high-growth companies. We want to invest in companies that have proven there is a viable model and, in most cases, viable products and services that they are offering. And we want to catch them just as they are getting that explosive, hockey stick-style growth. The model itself is something that we have been doing personally for years, and we have now put it into a vehicle such that we can take advantage of the scale that goes with being a public company. Tell us about the boss. 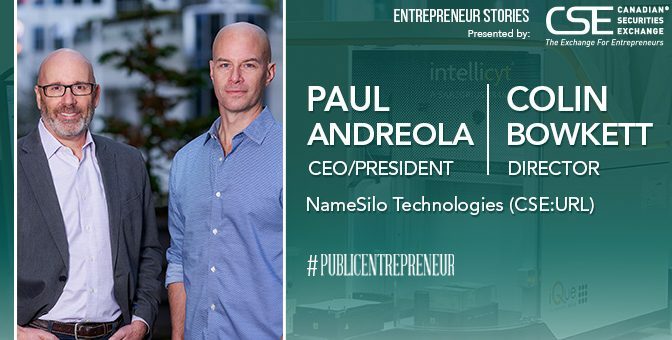 Who is Paul Andreola and what led you to build NameSilo? I have worn a lot of hats over the many years I have been at this. I used to be a stockbroker and spent roughly 10 years in the investment industry. I have seen a lot of deals and most of them are not good. The key is to try to say “No” as many times as you can and find that one little gem that comes along every now and then. I’ve also started two technology companies. One we took public and it did extremely well, and then the other one actually did not do so well. And we learned as much from that one as we did from the one that was successful. So, I’ve got the start-up and the go-public experience and that helps us when we look at new opportunities. Thirdly, I have an investment newsletter and a network of investors who all have the same mentality. We all want to find these little gems that are obscure and undiscovered. And we want to try to bring these companies everything they need to be successful. It’s a model that we have proven works. My other director is Colin Bowkett. He comes from a much purer venture capital background and has been in the markets for over 10 years. Compared to me he was a lot more involved in the speculative side of the business and is more of a people person than I am. The thing about investing is there are a lot of personalities involved and having someone with good people skills enables you to figure things out that you wouldn’t have been able to without the right skills. The third key person is Kristaps Ronka. He is an IT specialist who has worked for several tech companies, but his real claim to fame is that he and his partner started a tech company from scratch and took it from zero in sales to a run rate of around $100 million before it got bought out. He took some of the funds from his sale and has invested in a collection of other businesses. The NameSilo website states that there are lots of good investment opportunities, but NameSilo is looking for great ones. What makes a great investment opportunity? We take a GARP approach – Growth at a Reasonable Price. There are a lot of cases where you find a great company but it is priced for perfection, and that is not what we are looking for. We are trying to find situations where there is a great company at a great price. And we don’t just look at the public markets. We have managed to find several high-growth, low-priced public companies and have done it on the private side, too. That is where it gets really exciting because we think there is a very strong pricing arbitrage where you can find a company that might sell privately for 3 or 4 times earnings and the public comparables trade at 10 or 15 times earnings, so immediately there is a lift just by taking these companies public. We turn over a lot of rocks and are constantly looking. As far as public companies, we are numbers guys and we read every single SEDAR filing in Canada. There are very few companies we haven’t got at least a cursory understanding of. We have a formula we are looking for and if a company doesn’t meet that formula it gets crossed off. We literally go through thousands of them – to find even one you have to go through a lot. The private ones are a little bit harder to find. We have a network of people who know what we are looking for and typically the network brings us private deals to assess. A lot of them are companies not necessarily looking for money, but they may be looking for an exit. Great little businesses, run well, not necessarily needing money, so we don’t have the risk of financing them, but they just want a partial exit or something. We take them public and achieve that partial exit for them. Let’s look at your portfolio and how a company fits into the greater whole and creates value for shareholders. Perhaps begin with the latest acquisition, which also brought the company a new name. NameSilo is actually an anomaly. Until now, all of the companies we became involved with, we took no more than a high single-digit percentage ownership position. We’d find companies where in the process of going public we had the opportunity to purchase shares and then when it went public we would get that lift on our 5% or so. NameSilo is a company we have actually purchased 100% of, though we have carved out a percentage for the management team running it. But here is an opportunity where we think we are going to get 100% of the lift through that private-to-pubic arbitrage. That is likely to be the way we will perform going forward, taking a much larger stake in each company. NameSilo’s stock price has been doing well of late. It has doubled since the beginning of the year. What is driving that and what feedback do you get from shareholders? The biggest driver is the biggest part of our portfolio, which is NameSilo. We think it is outstanding. NameSilo is a domain registrar similar to GoDaddy or Tucows, but it is arguably one of the three fastest growing in the world. The company has been able to automate itself to be able to drive prices down to where nobody can compete on price with our core product. We are growing much faster than GoDaddy on a percentage basis. We think we bought it extremely cheap in comparison to the other publicly listed companies. We trade at a fraction of the metrics they trade at and we are growing anywhere between 80% and 90% organically, whereas GoDaddy is growing at about 15%. What is driving the NameSilo share price, I believe, is that people are beginning to recognize the undervalued nature of our major asset. Investing involves looking into the future and making certain assumptions. What do you see around the corner in some of the industries your companies are involved in? We are always looking for trends but not trends as you typically see in the venture capital market. We want to see established trends. We didn’t invest in the cannabis space. We didn’t invest in the blockchain space. We want to see trends that actually show up in financials. For example, one of our investments is a company called ImmunoPrecise. They’re a contract research organization for major pharmaceutical companies. What that means is major pharma companies don’t do a lot of the R&D in house but will contract it out to a company such as ImmunoPrecise. That is a major tailwind that a lot of people don’t recognize but that we are seeing in the numbers. We want to see high growth in the businesses we are investing in, because that is a sign the business is working. The other major trend to be aware of is the topic of passive versus active investing. The FAANG stocks – Facebook and Amazon and those names – there is a massive amount of money going into opportunities that have to be big enough for institutional funds to participate. The old active investor has given way to investing in ETFs or big funds that mirror the indexes or just buy a basket of the biggest stocks. I think we will see the pendulum swing back to the active investor who is a good stock picker. In the microcap space, liquidity has dried up and institutions have gone upmarket. In the long run what that does is open up a lot more opportunities for investors like me to go after these great little deals without the competition you would usually see. It also opens up a lot of opportunities for bigger companies to buy the smaller companies on the cheap. Any words of advice for up and coming entrepreneurs from your years in the business? The model that we have in Canada in the public markets really is second to none. As entrepreneurs, people should be aware that this tool is there for them. Especially if you have some degree of success. If you have a real business that is generating revenue, and in some cases profits, the ability to take advantage of the model here and some of the valuations you ultimately get, and the options that being public give you, is something entrepreneurs should seriously look at. This story was originally published at www.proactiveinvestors.com on January 2, 2019 and featured in the Public Entrepreneur magazine. Learn more about NameSilo Technologies at http://brisio.com/namesilo-technologies-corp/. 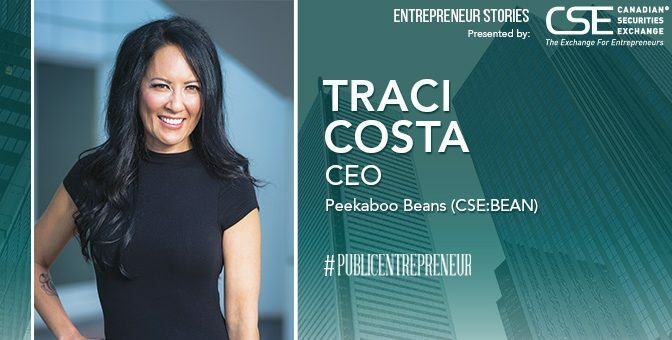 For Traci Costa, Chief Executive Officer of Peekaboo Beans (CSE:BEAN), her childrenswear company began as a labour of love – in her basement with her 2-year-old daughter, Cailin, surrounded by toys. Fast forward to today? It’s a high-stakes business with a strong sales force of brand ambassadors, also known as “Social Stylists”, and strong growth potential on the back of a shift in retail sales as millennials start to flex their fiscal muscles. Keep in mind, this audience spent US$200 billion last year, relying heavily on social media and influencers. As a company, Peekaboo Beans has had long-standing power, pivoting in multiple market situations. “This was about creating a brand through the eyes of a child,” says Costa, adding that when she started the firm in 2006, her goal was to design and create a functional apparel brand that was practical, fashionable and enabled children to live and play in comfort and style. She saw a gap in the market and felt strongly that there had to be a better alternative to childrenswear that was out there. Background in fashion? No. Background in entrepreneurship? Limited. But Costa had a vision. Today, the original mission remains the same, however its business opportunity has shifted. The global children’s apparel industry remains in transition mode; in the US alone, it’s currently estimated to be worth US$31.6 billion, despite excessive discounting and a slowdown in China. Peekaboo Beans aims to continue to raise the bar: its business opportunity is designed for parents on their own terms and own schedule, which is key for busy parents. The company has over 600 Social Stylists that offer customers personalized service through personal shopping, or online through social media platforms, such as Facebook and Instagram. Around 75% of these brand ambassadors are located in western Canada, primarily British Columbia and Alberta, with 20% in eastern Canada, mostly Ontario and the Maritimes. In addition, the company now has some 2,000 paid members who receive perks like free shipping and preferred pricing for an annual fee of $49. Many of these “beanaholics” are also involved in marketing efforts through a program that awards points to use for product credit when they refer friends, write reviews, or share Peekaboo Beans photos on social media. Some actually used to fall into the Social Stylists category but transitioned to the new membership program when it was launched in October. One market that continues to bloom is Peekaboo Beans’ US contingent: around 5% at the moment, but with potential to expand further in the future. We have grown our Stylist base all across North America, starting in Canada, and are further establishing the brand in 34 states this year,” says Costa. That demographic is key to the new strategy. According to Fung Global Retail, bricks and mortar retail stores continue to struggle: in 2017, 7,000 stores closed, which is triple the previous year. It’s a sobering statistic, indeed. But for Costa, it has given her the opportunity to pivot from getting her childrenswear in brick and mortar stores to a model that appears to have more staying power and potential. Her most challenging time, she said, was in 2008, on the back of the recession when the company was operating as a retail model selling to local boutiques and stores. Costa decided to steer Peekaboo Beans in a new direction, away from selling in retail stores to a more unified sales force, through a direct sales model. As successful as that model’s been, Costa is determined to stay on the leading edge of market, technological and demographic change. To keep out in front, Peekaboo Beans recently transitioned the direct sales platform to an omni-channel approach, one that engages sellers through social platforms, including Instagram and Facebook, as well as other retail channels to maximize revenue and build brand loyalty. “We’re moving it into a social selling platform where we can leverage technology and grow through an influencer base, social media and blogging — similar to an affiliate model,” says Costa. Costa says the company is focused on growth on all levels, with a particular emphasis on expanding the US segment of its business, alongside launching an Amazon store very soon. Temporary “pop up” shops have also proven to be successful. With increased operational efficiencies, better margins and a new recurring revenue model, “we expect to see profitability within the next 12 months with this new platform,” says Costa, adding she hopes to add another 500 affiliates in the United States this year. The US expansion plan will use a multi-faceted approach and the list of to-do’s is long: creating an e-commerce and wholesale strategy with a focus on certain markets, continuing to develop its social media strategy, attending more industry events, and increasing content with social media influencers. “We’re building a social impact movement with the people that sell our product,” says Costa, adding that the company places a focus on partnering with manufacturers who have standards that align with its values: no harmful chemicals and toxins. The year 2019 stands to be a good one for the company, as it will continue to transition from a direct sales model to a social retail platform. “This model will allow our Social Stylists to shop, save and earn commission through sharing the brand on social media,” says Costa. For now, Costa continues to push Peekaboo Beans’ forward with her goal to establish the company as an industry leader and category king in children’s apparel. This story was originally published at proactiveinvestors.com on January 2, 2019 and featured in the Public Entrepreneur magazine. Learn more about Peekaboo Beans at https://shopca.peekaboobeans.com/. To the outside eye, mining is often seen as an ossified industry, with visions of backhoes digging and drills turning. But that’s not the whole picture. And the picture is evolving quickly thanks to millennials. There are a host of millennials behind the scenes influencing change: enabling the industry to be more efficient and sustainable, alongside working with local Indigenous communities. Public Entrepreneur spoke to four millennials who are part of the wave of change. How is new technology changing modes of work in both exploration and development? JR: What we’re seeing is a trend towards safer, more efficient data collection. In particular, new technologies are being fostered by large corporations that have health and safety protocols that are far more robust than, say, a junior miner. I think that’s driving a lot of the technology and where it’s going. That’s not just about reducing cost but also reducing working hours in the field, such as data collection in inclement environments. Risk management is definitely one of the biggest drivers. AJ: I think one of the biggest things I’ve seen in exploration is increased efficiency. So, even on our drills, the drill foreman has his iPad, and data that used to be captured on pen and paper in the field is now all streamlined and bluetoothed in real time. AT: Low-impact technology, like droning, is critical, especially for early stage. If you’re in these areas and you’re not really sure what’s happening, it’s great to use low-impact tech and get that initial assessment. At the more advanced stage, you’re starting to see things like directional gyro-drilling, where you are able to send the gyroscope down the drill and get instant readings. This kind of tech is useful but costly. The tech is there. But it’s not always in the budget. For people considering getting into the mining industry, what career opportunities are there? What are the best growth sectors from an employment perspective? AJ: If I was to give anyone advice, I would say data analytics. I think that’s becoming huge in the mining industry as far as re-targeting, or looking at data for exploration projects, compiling data, or looking at data in a new way. That’s a new and exciting field. JR: I agree that data analytics and data management are huge. Lessening impact is also important. When you consider coming into the industry, think about how you’re going to reduce the impact of your work. The use of drones is just one example. AT: I think our industry needs to do a better job of communicating the benefits of working in the industry in our day-to-day lives and in our communities. We’re not communicating all the benefits of this new tech and safety. There’s a lot of room for people in social media, corporate social responsibility (CSR) and relationship-building. Anyone that can build a strong relationship will be able to have a strong hold in this industry. SC: The opportunities in this industry are many, enabling people to provide for their families and support their communities in a substantial way. Communicating these opportunities and benefits is key. Further to that, resource exploration and development must take into account local communities, such as First Nations, and any impact it may have. How do we do a better job of communicating the benefits from an employment perspective? SC: I would say get out into the communities, hold information sessions, etc. so that people not only understand the impacts, but the many benefits as well. As an example, we helped facilitate an Indigenous-led Training and Employment Strategy with several of the local First Nation communities near the project I work on to get everyone better prepared for future opportunities and start to identify and address any barriers to employment. AT: I think what you’re doing from a company perspective is incredible. We’re working on an initiative that will launch this spring, to go into communities to host a mining day. We’re also working to get mining-related curriculum into schools as well. Connecting with that age group of 5-18 is really important. We’re also trying to work really closely with politicians and influencers. When you talk about it to media, about green technology and clean jobs, there’s this sentiment that mining doesn’t have that. The fact is you’re not getting clean tech without mining, as you need these minerals to come from safe, regulated parts of the world to truly have clean industries and products – like electric cars. Lastly, one of the things we forget to communicate is if you want to stay and work in or near your community, mining is going to be an option for high-paying, rewarding, growth careers. SC: Having a local workforce, at the end of the day, in their own territories, can benefit an entire community. It is crucial to start learning about the communities and what is important to them at an early stage. It’s a good idea to find out where people’s skill levels are, having transferable skills is important too in a finite industry, and the potential to work with and train in local Indigenous communities could be one of the biggest assets for a project. JR: I feel like the biggest gap is the juniors, because they are jumping on and off of projects and there’s a short period of engagement. Or they go test the water with a 1000-meter drill program and expect to come back the next year with a fully funded drill program but it doesn’t happen. How can we mitigate that? Sometimes these projects just aren’t feasible. Even if a junior is responsible and tries to engage the community, there is just a general fickle nature of the finance community around resources and the ability to advance a project. AJ: On that point, that’s the challenge that we face as explorers, is that social chain of custody. We’re all told, engage early, engage often, continue engagement even when you’re not exploring. But it boils down to funds. This is a real challenge and it’s a real debate and topic we have to tackle in the industry. I do think it’s getting more noticed. We’re talking about it far more. What haven’t we talked about? AJ: One thing I find interesting is governance, in terms of what investors are asking us to disclose. That’s a huge part of something that is changing, right as we speak. ESG, or governance scores, are becoming increasingly important for investors. Investors are now calling companies, asking about disclosures: from climate change to human rights policies. They’re asking for that. I had no idea a few years ago that this would become so important and is an evolving piece of the industry. AT: One of the initiatives we just launched is Virtual Yukon, which is a virtual reality tour of the Yukon. We’re using it both as a CSR and engagement education tool as well as an investor tool. We’re going to be taking drones over most of the major communities and you’ll be able to visit different places. You can see some of the individual mining projects and companies can use it. We will also use it in the communities. Overall, using digital tools will be a huge asset to companies, investors and communities. They’re young. They’re powerful. And that wave of power is growing – quickly. Meet the millennial investor. Now, the catch: getting them interested in investing in the mining and metals industry. It’s a relatively untapped investor demographic, on the back of a tough half-decade in the space. But the potential for opportunity is growing, and this group of investors is demanding more of the industry: from more connectivity to increased transparency (and beyond). Public Entrepreneur spoke to three up-and-coming millennials who are helping push the space forward. Tell me a bit about your background. How did you get involved in the mining industry? AN: I began my professional career as a financial auditor while simultaneously completing the Chartered Professional Accountant designation. Later, I transitioned to investment banking, joining Dundee Securities, which recently became Dundee Goodman Merchant Partners, a mining-focused merchant bank. The clientele and deals I’ve been involved with have always exclusively been mining. JK: I’m a mining engineer. I’ve worked in a variety of places: Albania, Hong Kong, Mongolia, Baffin Island and have had a lot of different jobs on the technical side. In Vancouver, I worked primarily with a small management team that built a company that is called Equinox Gold. I left about a year ago to start my own venture: it’s called Ivaldi Venture Capital. We also run an investment research service called Resource Insider. We’re focused on deploying capital into mining and metals projects. We’ve done several deals over the last year, ranging between $1 million to $3 million. SK: My family has lived in Vancouver for over 125 years – we are one of the oldest Chinese families here so being a part of a legacy has always driven my interests into building something long-lasting. There’s nothing more constant than the need for minerals in the world. I’ve been hooked in the industry for over 12 years and plan to be for as long as I live. I currently do corporate communications and development for two Brazilian-focused junior companies. We’ve moved from a landscape dominated by resource exploration/development companies to one that now includes a major cannabis presence and increasing prominence of tech stories. How do you look at this new environment and what appear to be the challenges? JK: When it comes to mining, younger investors haven’t really had the chance to come into the space. I’m a millennial and during the last bull market, I was 24. I didn’t have any money to spend and most 24-year-olds are in that same situation. There hasn’t been much interest in mining since that time because there hasn’t been much opportunity to be interested. That money has gone to the cannabis space, the crypto space: these are industries that millennials are able to relate to very easily because people smoke cannabis and people grew up on the Internet. AN: What’s going to get millennials interested in mining is a broad commodity bull market in the resource space. Most millennials aren’t familiar with the wealth creation the resource space can offer and have recently been attracted to high flying sectors such as cannabis, cryptocurrency, and blockchain, until the financial hangover set in. A recent resource example were the parabolic moves in lithium and cobalt which was due to the electric vehicle trend. This was very engaging for millennials who can understand Tesla and lithium-ion batteries in their cellphones. Many of my friends who are not resource professionals would be talking about these commodities as a reaction to the rising share prices and they wanted a piece of the action. SK: Alternative companies and sectors outside of mining have done well to get their stories and opportunities out to a new wave of investors, millennials. Ten years ago, you wouldn’t see my generation investing in stocks yet now they all have brokerage accounts. It’s now up to us as an industry to capture their attention through avenues that they could relate to and not just the stories of how the industry titans like mining billionaires Robert Friedland and Ross Beatty got their investors and themselves very rich. We need to teach millennials that mining is the most constant sector and has tremendous upside and applications through avenues such as video, virtual reality, social campaigns, and telling stories that would resonate and engage their curiosity and understanding of the resource sector. It is time for our industry to innovate, rejuvenate and disrupt how it once was. Gold and silver have long been a primary focus for investors in the mining space but new market segments, such as battery metals, have the potential to attract a different type of investor. What do you think about this? JK: I think it’s happened. The energy metals sector, be it lithium, cobalt, vanadium, has done a very admirable job of piggybacking on the tech industry. Elon Musk has inadvertently become one of the most successful mining promoters in history. There’s been a demand and companies have done an impressive job of tying their product into something people care about, as compared to mining. SK: There is money to be made in these new segments. I’ll take us back to 2006-2008 when the craze in the sector was rare earth metals. Unfortunately, China came in and flooded the market with supply and that quickly stopped the demand, but the run-up saw investors making money. Come 2011, it was all about graphite and graphene. Again, the market got flooded but investors made money. Here we are, now comes energy metals: cobalt, lithium, vanadium. Yes, these battery metals are desperately needed as we revolutionize the way we live and do things and investors will make money, but these run-ups are not constant like precious metals gold and silver. AN: From a market observation, most battery metals such as lithium and cobalt are very small markets, each approximately sub-US$10 billion relative to gold and copper, which are around US$100 billion-plus. It doesn’t take much capital to move these smaller markets and those are trades that you need to get in and get out of within a 12 to 24 month timeframe. A lot of those companies are speculation, rather than investments. The point is, if you want to speculate in these small markets, make sure you have impeccable timing. What is the entry point to getting a millennial investor to begin researching a mining stock? How do you get them interested in the first place and what feedback have you had from this generation of investors? JK: I think about this a lot. In other industries there are influencers. It’s not a coincidence that Kylie Jenner’s makeup company is a billion-dollar company. It has nothing to do with the quality of the product, it has to do with her persona. 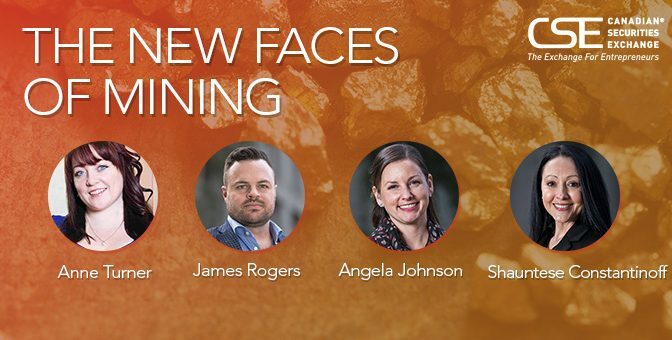 There are not a lot of young influencers within the mining industry. There are a few people my age (30s) and there are a lot of people in their 60s. There’s a gap and I think we need more public-facing influencers – letter writers, CEOs, leaders in the industry of any type that can generate interest – and that will bring them into the industry. That said, influencers have to get the timing right. If there’s not money to be made, no one is going to care. 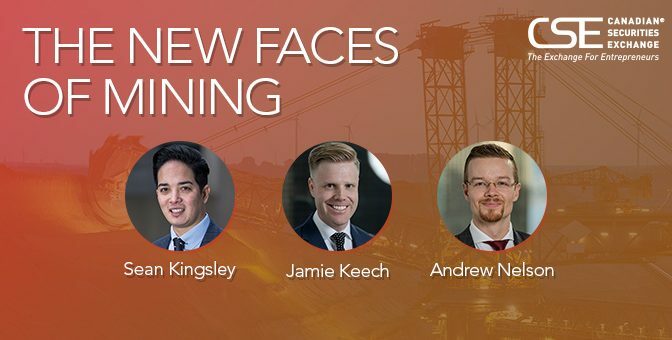 When I think about mining, there’s an adventure aspect to it: there’s travel to exotic locations and we know millennials are the best-travelled generation yet. This is an aspect that can engage people and enable them to see the potential in the space. That’s what’s going to bring investors in. It’s a multi-step process. You need an interesting story, you need the potential to make money, and you need public facing personas that people trust. SK: For me, it’s got to be about the tremendous upside in value creation and I often point to the discovery phase of the Lassonde Curve chart which outlines the life of mining companies beginning at exploration and ending in production, showing value that the market attributes to each stage. Once millennials really start to understand that everything in the world is only possible with the minerals that we discover and mine and of what opportunities that creates for our generation will they realize the endless possibilities and upside potential of the sector. AN: There’s a massive opportunity here to shift the way millennials look at investing in mining. Millennials are now the largest generation in Canada, but are the least invested in stocks, but are the most likely to participate in an online financing. Recently, I received a shell opportunity in my inbox. I passed but another millennial I know subscribed. To partake only required 5 minutes and was a very simple process. The company raised 324% over their targeted funding and brought in 201 investors in a matter of six days. This is one of the major platforms I believe will be used to complete resource financings with millennial investors. 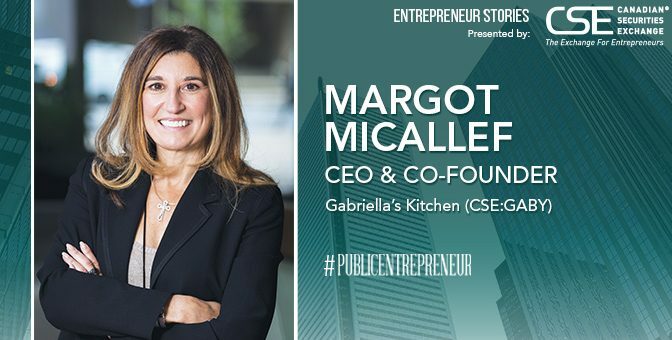 When you first meet Margot Micallef, chief executive officer and co-founder of Gabriella’s Kitchen (CSE:GABY), her authenticity shines through: her firm handshake, her warm smile and her clear words. It shines through particularly strongly when she talks about her sister: Gabriella, the namesake of Gabriella’s Kitchen. Although Gabriella passed away after a battle with cancer, she remains the company’s inspiration. The pure-play cannabis wellness company has come a long way since creating its original award-winning skinnypasta, a high-protein, low-calorie and low-carbohydrate fresh pasta. Other product lines have been added to the shelf: noodi, gabbypasta and most recently alto, which includes the company’s cannabis-infused products. Today, the vertically integrated, branded, consumer products company focuses on utilizing cannabis for the lifestyle consumer. Not to mention the benefit of having Micallef at the helm. Her resume is impressive, to say the least: a lawyer and philanthropist, founder of Oliver Capital Partners and a former Senior VP at Shaw Communications. 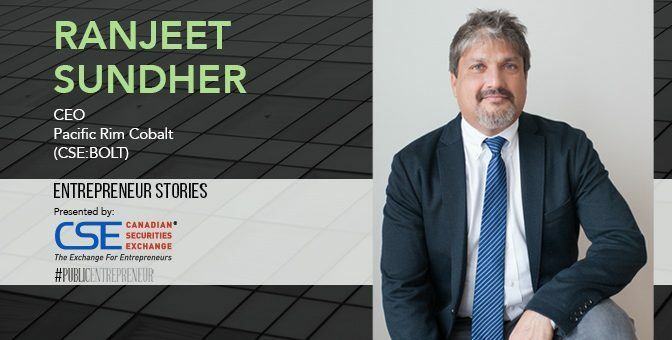 Public Entrepreneur spoke to Micallef about Gabriella’s Kitchen’s origins, its new line of cannabis products and global expansion plans, and how the company is seeking to change the conversation around cannabis health and wellness products. Q. Can you give us some background about how Gabriella’s Kitchen started? My sister, Gabriella, and I decided to move to a healthier lifestyle and identified a derth of products in the market, primarily around food, that supported a healthy lifestyle. We saw the business opportunity. As we were launching our business, my sister was diagnosed with stage IV lung cancer. The diagnosis really brought home the need to change our lifestyle and focus on our health and well-being that was within our control. Her doctors couldn’t do anything for her and they told her that. The pasta line was inspired by the dietary restrictions Gabriella faced throughout her cancer journey. The beauty of what we did was that we were able to prolong her life for five years. She had great quality of life and really learned to value the foundation of health and wellness through diet and lifestyle. Q. I don’t think many people realize the effort it takes to get a product on the shelf. Can you walk us through it? It’s tough. In order to get your product on the shelf you have to dislodge somebody else’s product. That’s something most people don’t understand. We knew going in we were going to make amazing products, that there was a demand for these products and we were going to get them to market. But it’s a lot more work and a lot more money and takes a lot longer than anybody thinks it’s going to. We started it in a little retail location in Toronto — we moved to Toronto from Calgary because that was the biggest market in Canada. We’d make the product in the back and sell it out the front. At 3:00 pm each day, Gabriella would close up and go pound the pavement — and slowly and surely, we got more retailers. We got up to around 200 when she passed away in 2011. I ended up taking over the business in 2015. I’ve invested about $5 million and raised another $19 million to date. Q. What have you used the funds for and walk us through how you leverage the infrastructure you have in place? We’ve used that money primarily for product development and to build out our team and infrastructure. That’s our differentiator. With our strong infrastructure, we can move into any channel we want to, including the licensed cannabis channel. We came upon the cannabis space about a year ago when we examined the healthful properties of cannabis. In many ways, our approach was opposite that of many other companies, which have an idea, raise the money and then build the infrastructure. We already have the infrastructure and the team with the knowhow to get the product on our shelf. Our existing business line has more than 30 unique products that cater to health-conscious consumers, whether they shop in the mainstream shopping channels or in the licensed cannabis retail channels. Leveraging our existing infrastructure means we can move product into a channel much more rapidly than anyone else can. Q: Talk about the cannabis space and what kind of consumers you’re looking for. Our goal is to serve consumers wherever, however, and whenever they want to consume cannabis wellness products – and that means in the mainstream channel or in the licensed cannabis retail channel. We’re looking at a diverse range of products as vehicles to assist them in their chosen modality for consumption. We already know that the mainstream market is going to start carrying CBD-infused products in a big way. I believe that once federal legislation in the US changes, there will start to be a move afoot to get all cannabis infused products into mainstream channels. We will be ready for that opportunity. Consumers are changing their perspective on health and are looking for new ways to supplement or replace traditional medicine. Q. Can you talk about how your team continues to be built out? We’ve got a whole research and development department. One to note is Mara Gordon, who is a pioneer in the cannabis space and our chief research officer. She has amassed a database of formulations and health attributes associated with the cannabis plant that she has garnered from her own experience in working with physicians, clinicians, researchers and patients over the last 10 years. We also continue to build out our expertise in the cannabis channel, having just hired a VP sales-licensed channel and acquired Sonoma Pacific, a licensed cannabis distribution company in California. We also have a business development team that is scouring North America for brands that we want to bring under our umbrella. We want to grow through acquisition as well as through innovation. Q. What does your next year or two look like? We want to be the category leader in the cannabis wellness space. Not “one of” the leaders, rather, “the” leader. We know that the category leader takes 70% of the economics off the table. We want to be the one that everybody else wants to chase. We want to do that for two reasons. One is that we believe that when the federal landscape changes in the US and the big players move into the market, we think that they will look for acquisitions that will move the dial for them. We believe that if we can build a significant platform in North America that we can then partner with a global player and benefit consumers in a much broader way and, of course, benefit our investors. This story was originally published at www.proactiveinvestors.com on December 4, 2018 and featured in the Public Entrepreneur magazine. Learn more about Gabriella’s Kitchen at https://gabriellas-kitchen.com/ and on the CSE website at https://thecse.com/en/listings/diversified-industries/gabriellas-kitchen-inc. 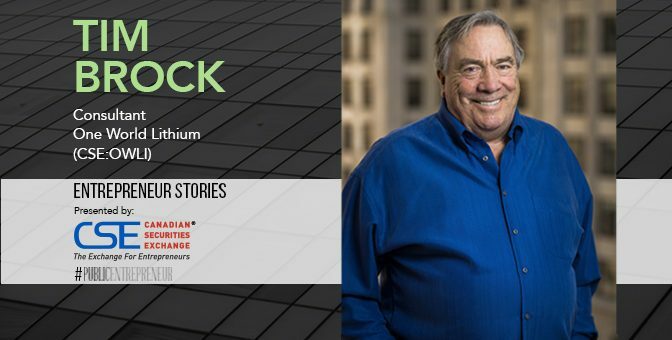 It is clear from speaking with people both inside the Canadian Securities Exchange and around the broader financial community that 2018 is going to be remembered as perhaps the most transformational year in the CSE’s history. Huge financings, billion-dollar market caps, a steady stream of international listings, and financial institutions investing in CSE issuers like never before are only some of the talking points. Fast-growing, well-capitalized companies and strong investor interest in them have elevated the exchange to a new level. Total capital raised by CSE issuers looks set to increase by over 500% compared to 2017, with a chance at topping the $5 billion mark. Curaleaf Holdings certainly played its part, raising $520 million during its listing transaction in October. The company stated in a related news release that over 100 financial institutions had supported its financing. Climbing 13.25% year-to-date, the total market capitalization of CSE listed is growing appreciably thanks to the contributions of several larger entrants to the marketplace. And while Curaleaf leads the way with its $2+ billion valuation, there are plenty of other issuers that qualify as solid mid-caps in the Canadian market. Microcaps still constitute the majority of listings, but bigger companies are finding the exchange to be a suitable home as well. It’s no secret that the CSE is the go-to exchange for listing cannabis companies with operations in the United States. 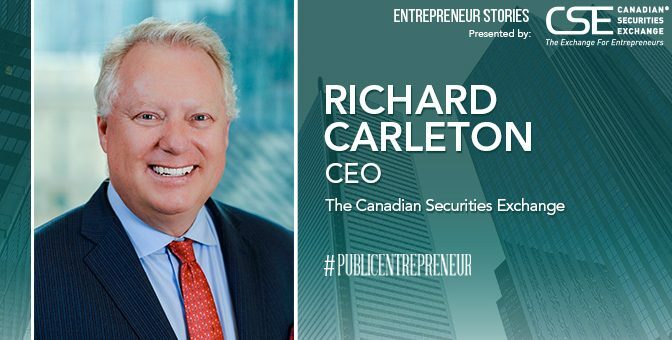 The CSE never shied away from the cannabis industry in Canada, and when considering how to manage prospective issuers from south of the border, exchange officials spent time with regulators and professional services providers to confirm there was a high degree of comfort with the industry’s risk profile. One of the advantages of investing in public companies, after all, is strict disclosure standards designed to ensure that investment risk can be accurately assessed. The next development in the cannabis sector at the CSE, beyond more large listings almost ready to debut, is the development of cannabis index products in 2019. “The CSE is the only location globally where you see as heavy a concentration of US cannabis issuers, so we are the logical place for such an index to be calculated and disseminated,” notes Carleton. Could related ETFs be far behind? Whilst cannabis stocks may be dominating the headlines, the CSE has also welcomed a strong contingent of new mining companies in 2018, a total of 57 through the end of November. Tech listings have been increasing as well, even though appetite for everything blockchain has slowed compared to the enthusiasm of late 2017. Interestingly, the industry enthusiasm for cannabis might just dovetail with ongoing international outreach initiatives by the CSE to put new funding alternatives on the table in the tech space. Smaller companies in the US and other international markets are finding it increasingly difficult to obtain private funding as private equity funds increase in size and need to make larger investments in portfolio components. A primary Canadian listing on the CSE would be worth considering for many young growth companies. Speaking of tech, the CSE has an ongoing project of its own in the form of a blockchain-enabled clearing and settlement facility. The project team is in the late stages of quality assurance and plans call for moving to external testing with dealers and other interested parties before the end of 2018. Continually working to improve the issuer experience is an important part of the CSE’s culture, and that’s reflected in exchange staff organizing or participating in over 80 events during 2018. New issuers will be pleased to learn that they are joining an exchange that again set full-year records for trading volume, trading value, and other measures of investor participation. In the first 11 months of the year, trading volume was already 54.97% higher than the total for all of 2017, topping 27.05Bn shares. Most measures of investor activity had actually surpassed last year’s record levels by mid-summer. And with the listing application pipeline exceptionally healthy as we head into year-end, look for 2019 to be another blockbuster. Granted, capital markets in Canada are having a better year in general, but the CSE’s pace of growth in 2018 is validation of a business model that puts the needs of issuers first. Fund managers from around the world confirm this, sophisticated management teams who choose the CSE over multiple alternatives confirm this, and investors trading tens of millions of shares per day in individual companies confirm this. Carleton and his team see it first-hand and fully anticipate 2019 to be another year of growth and progress in many forms. Be it cannabis and tech businesses listing from the US, Israeli companies following up on the CSE’s multiyear effort there to introduce the listing concept, or new investors learning about the many opportunities presented by CSE issuers, the outlook could hardly be brighter. This story was originally published at www.proactiveinvestors.com on December 31, 2018 and featured in The Public Entrepreneur magazine. Learn more about the Canadian Securities Exchange at https://www.thecse.com/. As we close in on the final month of 2018, global oil prices have gone topsy-turvy, with predictions of $100 oil just a few weeks ago giving way to concern that the recent 25%+ drop to below $55 per barrel (for benchmark West Texas Intermediate) could grow even steeper. In an environment with this level of volatility, junior oil and gas companies need quality assets, good financial structure and adequate funding, not to mention a reasonable degree of managerial flexibility. These characteristics sum up Permex Petroleum’s (CSE:OIL) approach to operating successfully in today’s oil market. All the excitement is justified, mind you, as Ehsan explains in compelling fashion. Even more important, according to Ehsan, is rig count, as this is a measure of investment dollars going into a region. “There are 475 rigs in the Permian, which is more than 40% of US rigs,” says Ehsan, adding that this number also represents around 20% of all oil rigs operating worldwide. One of the oldest adages in the stock market is to buy low and sell high, and Ehsan utilizes a similar approach to execute the Permex business plan. The company adds assets to its portfolio in times of general industry distress, thus enabling it to buy properties at a discount. Importantly, Permex only buys properties that are in production or can be brought online at Permex’s timeline and discretion. 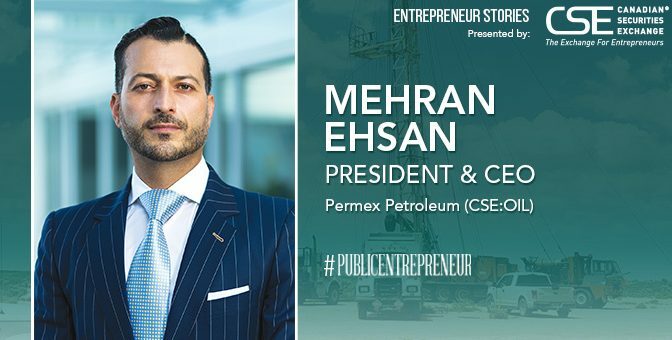 Ehsan only considers properties that the company can produce from on day one from active wells, and potentially drill later with an exceedingly high probability of success. Permex is careful to only operate in regions where producing formations tend to provide some of the highest historic success ratios, low production costs, extensive infrastructure to get end-product to market, and, importantly, a regulatory regime that favours the industry instead of throwing red tape at it. West Texas and South East New Mexico tick all those boxes. In fact, one of the formations that Permex wells produce from, the San Andres, has a breakeven cost of US$29 per barrel. In the last two quarters, Permex has begun to bring shut-in wells online and use water floods to pressurize reservoirs to enhance production. And the next stage of Ehsan’s strategy really enables Permex to scale its top line. That timeline is prudent, as overall production in the Permian has increased to the extent that there are bottlenecks in the pipelines that transport oil to market, and the result is that producers are having to accept a discount to the standard WTI price, although it is nowhere near the discount Canadian producers are exposed to right now. Again, this is where location comes into play, as adding pipeline capacity in Texas is much easier than it is in most other jurisdictions. Ehsan says there are four expansion projects in the works, one of which should come online in the first quarter of 2019. The added capacity should begin to shrink the price differential immediately, and eventually eliminate it altogether. This would put smiles on the faces of companies big and small, and it’s worth noting who some of the big ones operating side-by-side with Permex are. Occidental Petroleum has a major presence in the Permian, as new chief executive officer Vicki Hollub has shifted operations from a Middle East focus to one more on domestic production, such as in the Permian. Occidental is actually a working interest partner with Permex on one of its properties. Other offset operators to Permex include large-cap oil giants such as Devon, Hess, Apache and Conoco Phillips. This story was originally published at proactiveinvestors.com on January 15, 2019 and featured in the Public Entrepreneur magazine. Learn more about Permex Petroleum at http://www.permexpetroleum.com/. 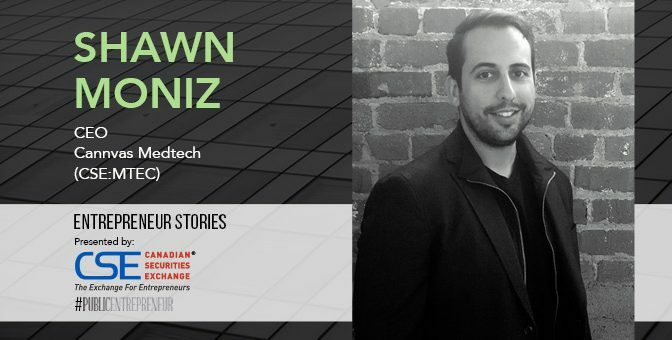 “We really want to be the Google of cannabis data,” is how Chief Executive Officer Shawn Moniz sums up the mission of Cannvas MedTech (CSE:MTEC), a Toronto-based startup that specializes in educating the public about marijuana. Having watched from the sidelines as Canadian companies sprung up to offer marijuana and its associated hardware, such as vaporizers, Moniz chose the less-travelled road of education when he launched his own cannabis company. Cannvas MedTech went public in July on the Canadian Securities Exchange as well as the Frankfurt Stock Exchange. Moniz decided instead to offer straight talk about cannabis after spending five years building platforms for big pharmaceutical companies like Pfizer, AstraZeneca and Bayer – which tended to put patients first in discussions about drugs. “So, I said hey, why don’t we just do what I did in the digital pharma space and bring that patient-centric approach to the cannabis industry,” he adds. At the core of Cannvas MedTech’s business is its website Cannvas.Me, which provides online cannabis courses for free. Cannvas.Me offers the chance to read about cannabis’ medical applications in materials put out by physicians along with an online cannabis course, marijuana product reviews and a cannabis strain matcher that determines which variety is suitable for a specific ailment. The goal is to reach 100,000 users of the platform by the year’s close. As more marijuana buyers explore Cannvas MedTech’s web site, they will provide data that will power the analytical side of Cannvas’s business, which has the lofty goal of providing the equivalent of census data for the cannabis industry. Indeed, layered just below its education platform is Cannvas Data, which uses algorithms to pull apart the research on cannabis trends and find new data that might be of use. Via its connections to other cannabis companies, academics, doctors, and governments as well as its own web site, Cannvas management is set to ramp up its data collection around the world. As Cannvas MedTech’s business takes off, the idea is that its data will become more tailored to the marketing needs of cannabis companies and the research needs of governments, physicians and academics. Its management will be able to tell, for example, how the consumer tastes of a 25-year-old construction worker in Ontario compare to his or her counterpart in Australia. They might also be able to determine the extent to which patients at military bases are taking cannabis to address their cases of post-traumatic stress disorder. “People educating themselves about cannabis is where we win. There’s a lack of awareness and a lack of education and the data is key to that,” notes Moniz. Partnerships are pivotal to the company’s ability to gather information. In one of its most prominent tie-ups to date, the company recently signed a revenue sharing agreement for Cannvas.me with the Vancouver-based e-commerce platform Namaste Technologies, which runs medical cannabis patient portal Namaste MD that has a reach extending to 20 countries and boasts a database of 1.5 million users. Namaste has developed the country’s first cannabis telemedicine app, available on iPhone and Android devices, which allows patients to connect to doctors or nurse practitioners for consultations within minutes. “The data is really going to set us apart within the industry. The Cannvas.me platform on a global basis will collect all of that data and feed it back into the industry,” reports Moniz. Cannvas Connect, meanwhile, is the third branch of the business as it offers a secured network to allow for the sharing of Cannvas’s data with, say, Health Canada or the company’s other partners in academic and medical circles. The company’s goal is to have software in at least 100 clinics within the next year. Keen to remain independent from the clutch of licensed marijuana producers who control the industry, Moniz and his management team opted to take Cannvas public instead of approaching companies for money. “We wanted to remain non-biased so the only way to do that is to make sure we got funding agnostic of any licensed producer,” he says. Since its launch last September, Cannvas has built up a staff of 19 with offices in Vancouver and Toronto. As Cannvas widens its global reach by introducing its software in clinics around the world, it aims to become the international authority on the cannabis sector. Information will drive the company forward, along with the industry itself, Moniz believes. This story was originally published at www.proactiveinvestors.com on August 31, 2018 and featured in The Public Entrepreneur magazine. Learn more about Cannvas MedTech at https://www.cannvasmedtech.com/ and on the CSE website at https://thecse.com/en/listings/life-sciences/cannvas-medtech-inc.
Energy storage sounds very much like a prosaic industry, but it is poised for a boom. One World Lithium (CSE:OWLI) hopes to be part of the explosive growth. Tim Brock, a consultant to One World Lithium, or OWL, believes that a junior company with an eye on eventual production must strive to be a low-cost producer with a long-term supply contract. “One World Lithium has the potential to do this,” he said. OWL has reason to be excited, given the particulars of its Salar del Diablo property in the State of California Baja Norte, Mexico. The project covers a large closed basin that provides a compelling exploration setting for the presence of lithium in brines. The Salar del Diablo project has the potential to be a low-cost producer, one reason being that it sits about 35km from San Felipe, a cost-efficient regional service center with a deep-water port that could ship lithium carbonate to customers in Asia and the rest of the world, Brock explained. One World Lithium has an option to acquire up to a 90% interest from the New Energy Discovery Group. The company currently has a 60% working interest and on completion of the initial drilling program will have earned an additional 20% working interest with an option to purchase an additional 10% on receipt of a bankable feasibility study. OWL expects to have an OTCQB listing in September as well as to be interlisted on the Frankfurt Exchange. Lithium has multiple industrial applications, including lithium-ion batteries, heat-resistant glass and ceramics, lithium grease lubricants, plus as an additive for iron, steel and aluminum. All told, this creates demand greater than current world supply. Demand for lithium-ion batteries for electric cars, storage, and mobile devices by manufacturers in Asia, Europe and North America, has mixed with supply trends to drive lithium prices significantly higher. The price of lithium is up 870% since 2005, and 177% in the last year alone. In addition, countries are beginning to set dates after which all vehicles sold must be non-internal combustion. Brock believes several trends will influence the energy storage industry through 2025. Demand for lithium carbonate will more than double to 600,000 tonnes by 2025 from 270,000 tonnes in 2018. Meanwhile, supply should rise to between 500,000 and 700,000 tonnes in 2025, compared with about 200,000 tonnes at present. Lithium supplies currently dominated by Albemarle Corp., SQM and FMC Corp. “may be challenged as more independent production of lithium comes on line,” Brock notes. All of this is keeping the energy storage industry on the boil. The Salar Property is slated for drill-testing in late October 2018. Plans call for 4,000m of drilling at 11 drill site locations to intersect possible lithium bearing aquifers. The pre-drilling results from geochemical, geophysical and geological work defined over 60 sq. km of potential lithium in brine aquifers (formations). The Salar is approximately 8,000 feet deep, which gives the potential for stacking of more than one aquifer going to depth. There are five geological conditions that must be present in order to successfully explore for a lithium-in-brine deposit. These are a closed basin, meaning that no fluids can escape; presence of hot springs; a volcanic source of lithium; faults to transport the lithium to the Salar; and a regional heat source. The Salar del Diablo meets all of these necessary conditions. As a comparison, these conditions are also present at the Salar de Atacama, which is a similar size to the Salar del Diablo. OWL has been in discussions with potential buyers as well as offers to joint venture future exploration but elected to drill the property on its own. The market is watching in anticipation as the Salar del Diablo project is one of the largest lithium-in-brine prospects to be drilled in 2018. This story was originally published at www.proactiveinvestors.com on August 29, 2018 and featured in The Public Entrepreneur magazine. Learn more about One World Lithium. at https://oneworldlithium.com/ and on the CSE website at https://thecse.com/en/listings/mining/one-world-lithium-inc. The mining industry veteran says lithium-ion batteries can be used to smooth the flow of power. They can be integrated into electricity systems so that if a main source of power fails, it provides a backup, improving reliability. In contrast, Pacific Rim Cobalt’s Cyclops Project has excellent logistics and infrastructure. Located 15 kilometres from the Sentani Airport, the project’s tidewater location offers strategic access to China, the largest battery metals market in the world. This story was originally published at www.proactiveinvestors.com on September 10, 2018 and featured in The Public Entrepreneur magazine. Learn more about Pacific Rim Cobalt at https://pacificrimcobalt.com/ and on the CSE website at https://thecse.com/en/listings/mining/pacific-rim-cobalt-corp.